Hello there and thank you for stopping by today. Today is the second day of the MFT Release Countdown. Only 4 days until the new release (yay)! Be sure to head over to the MFT Blog for full set and die reveals for the day. This release is packed full of gorgeous new products that I have SO enjoyed creating with. 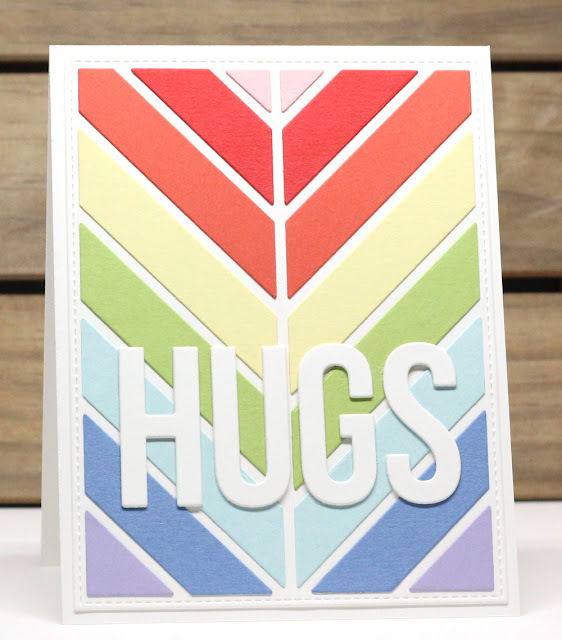 My card today features the new Chevron Segments Cover-Up and Big Hugs Die-namics. I used the die cut for placement of the pop-outs and then overlaid the pattern with the sentiment. These products and many more will be available for purchase in just 4 days, on January 10 at 9 PM EST. Be sure to check out the MFT Blog to see what the rest of the team has come up with today. Very striking card. Love the soft colors and HUGS focal. What a terrifically clever way to send your Hugs message by the colors and direction of the big chevrons! CAS perfection! Totally love this awesome chevron rainbow card! TFS! What a pretty sunshiny card. Love your colors and design. Thanks for sharing. Nice way to send bright and cheery hugs! So pretty! Jody--Very pretty card! Love the colors. your coloring card is so pretty!